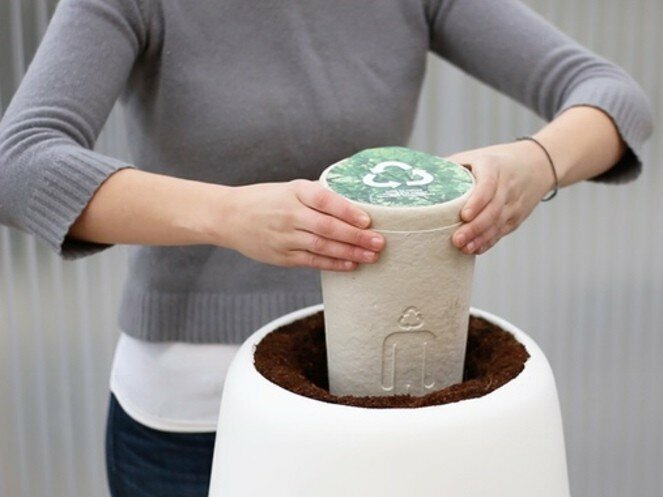 The Bios Incube system, which went on sale in June after a successful crowdfunding campaign, is the latest iteration of a much older idea in which ashes are essentially used as compost for a memorial tree or plant. But the Incube system adds some high-tech twists. The biodegradable urn is placed within a 5-gallon planter with an elegant, off-white, minimalist design vibe — call it the iUrn. Actually, that’s the Incube. Fill it with water and an internal irrigation system kicks in while separate sensors monitor the progress of your plant, taking constant readings on temperature, humidity and soil conditions. This information is wirelessly beamed to the included smartphone app, allowing the bereaved user to better care for and nurture the seedling as it grows into a tree. Roger Moliné, co-founder of Bios Urn, says the company offers two versions of its system. One provides the basic biodegradable urn and planter at $145. The more expensive version — if you want all the high-tech bells, whistles, atmosphere sensors and smartphone apps — tops out at $695. “Interestingly enough, we have found so far that most have opted voluntarily for the high-tech option,” Moliné says. He has a theory on that. The Bios Urn is part of a high-tech system in which the ashes of a departed loved one are used to help grow a tree. The Bios Urn concept is indeed part of a larger transformation in which technology is changing how we think about death and dying, says Candi Cann, author of the bookVirtual Afterlives: Grieving the Dead in the Twenty-first Century. “Their approach implies a different sort of afterlife than the religious one — an afterlife that theoretically we can partake in,” says Cann, who teaches religion and world culture at Baylor University. Cann has done extensive research on modern mourning rituals around the planet, and the various ways that technology is impacting how we deal with death and dying. The Internet has certainly changed the way we do things. Obituaries are posted online, funeral arrangements are sent by email or text, and social media platforms like Facebook now offer a range of memorial pages and legacy contact options. In general, this is all good healthy progress, Cann says. “Smartphones and social media spaces have forced a decline in the importance of a controlled obituary narrative, as more people can contribute to the communal memory of a person and the meaning of their life,” she says. A recurring theme in Cann’s work concerns an odd and abiding reticence in mainstream Western attitudes toward death: In short, we just don’t like to talk about it. Our aversion leads to a lot of unhealthy sublimation in the culture. “I would argue that the reason we see so much death in the media and in video games is precisely because we are not having real conversations about death,” Cann says. Technology is helping in that arena, too. Cann points to online communities like Death Cafe, which use Internet forums to arrange local meetups for people wanting to talk about death. Then there is the issue of what to do with the remains. We humans have been navigating this dilemma since the dawn of civilization, but recent technological advances have opened up some options. You can have ashes incorporated into jewelry, blended into oil paintings, mixed into tattoo ink, submerged into coral reefs or even pressed into vinyl records. And don’t forget about the festive fireworks option. 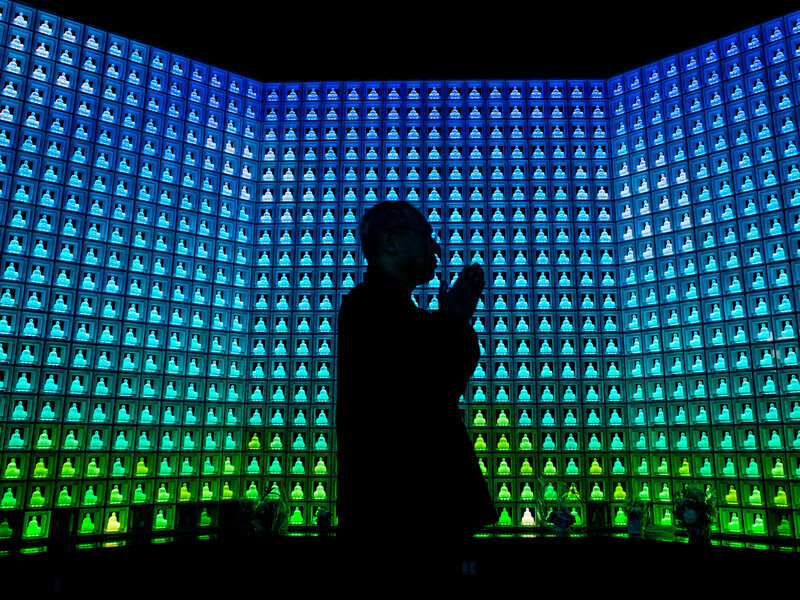 While developing the Bios Urn system, Moliné explored how other cultures are processing cremains, like Tokyo’s unique Ruriden columbarium, which utilizes LED Buddha statues and digital smart cards. The Ruriden columbarium houses futuristic alters with glass Buddha statues that correspond to drawers storing the ashes of the deceased. Cann says that these new modern rituals, facilitated by various technologies, can help us get a little friendlier with death. Looking to the future, however, Cann addresses more worrisome technologies. Proponents of this idea contend that uploading the mind into a computer is entirely plausible. But science fiction has some cautionary tales in this area — any technology that promises to defy death is usually nothing but trouble. Ask Dr. Frankenstein. Even speculating on this sci-fi scenario can get a bit dodgy, Cann says. In this light, the Bios Urn seems like a fairly gentle step forward. Technology can’t yet provide us with digital immortality, but it can help us grow a memorial tree in our living room. What’s not to like? Glenn McDonald is a freelance writer, editor and game designer based in Chapel Hill, N.C. You can follow him @glennmcdonald1.